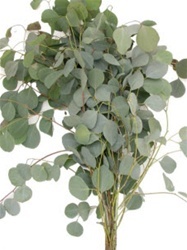 Silver Dollar Eucalyptus is an aromatic filler with a long vase life. Its large rounded leaves attractively contrast with smaller lateral branches. The silvery green color makes it desirable accent for flower arrangements. It comes in grower's bunches of 7-12 stems. This popular greenery is a perfect filler for any wedding bouquet, table centerpiece or flower arrangement. Free Shipping! If you care properly for your Wholesale Silver Dollar Eucaplytus, they should last at least a week in the vase. Since your flowers will be shipped direct from the farms, you will be receiving them at the same stage as a flower wholesaler. So they will probably look different than you are used to purchasing. After they have been properly hydrated and put into a state of suspended animation, they ship in dry packs (usually). It is NORMAL for your flowers to appear sleepy and thirsty on arrival.With proper care, they can last up to two weeks or more. A few hours after hydration, they will perk up and look dramatically different. For your Wedding or Special Event, we recommend that you have your Wholesale Flowers or Wedding Flowers delivered 2 to 3 days before the actual event. For a weekend event, your flowers should be delivered on the Wednesday (or Thursday at the latest). Schedule lilies 4-5 days before your event so they have time to open. We use FedEx, UPS and OnTrac for overnight delivery service. Your flowers will most likely be delivered before 10:30am. If you are in an extended delivery area, they should arrive by 5 p.m. Contact FedEx or UPS for the guaranteed delivery time for your delivery Zip Code. You should receive an automatically generated tracking number by email the by the evening before your scheduled delivery date. You can use it to track your package online at www.FedEx.com. Each order must have a working telephone number. FedEx not accept any orders without a working telephone number. 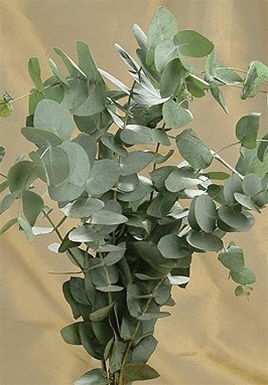 Silver Dollar Eucalyptus is an aromatic filler with a long vase life. Its large rounded leaves attractively contrast with smaller lateral branches. The silvery green color makes it desirable accent for flower arrangements. It comes in grower's bunches of 7-12 stems. This popular greenery is a perfect filler for any wedding bouquet, table centerpiece or flower arrangement. It is available year-round from our flower farms in California, Florida and South America. Each package is carefully packed and shipped to your door. Shipping via FedEx is FREE!